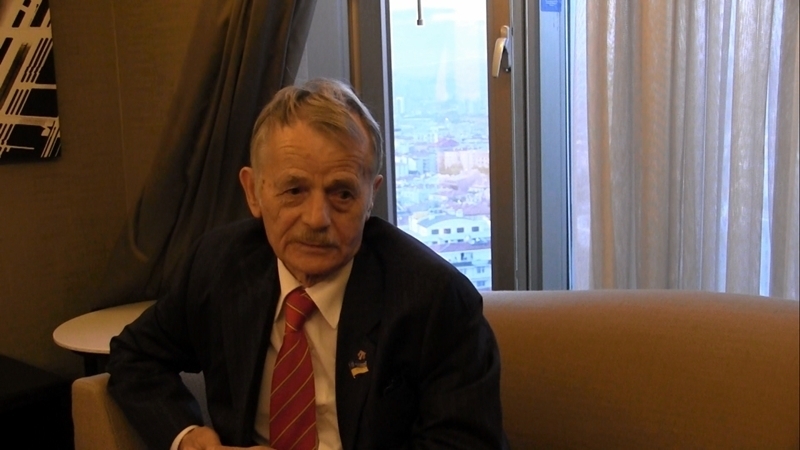 The Presidential Commissioner of Ukraine for Crimean Tatars, the leader of the Crimean Tatar people Mustafa Dzhemilev told QHA correspondent about the current situation in the occupied peninsula and about Russian-Turkish relations during his visit to Turkey. Dzhemilev said that the creation of a group of friends of the Crimea can be of great value in the de-occupation of the peninsula. “Two days ago, President of Ukraine Petro Poroshenko spoke about the Crimea at a meeting of the UN General Assembly. In his speech he drew attention to the violation of human rights in the Crimea, and also called for "the creation of a group of friends of the Crimea and Ukraine." It is not yet known which countries will join this group, but I'm sure there will be a lot of them. And I think that the creation of such a group will be of great value in the de-occupation of the Crimea. I will leave for Washington in October-November. And within the framework of my visit I will talk about the Crimea," he said. The leader of the Crimean Tatar people further commented on the agreement on the purchase of S-400 missiles, signed between Turkey and Russia, noting that it will not bring the countries closer together in any way. “Russia is the aggressor, which caused damage to many people, the state that has occupied our land. But, unfortunately, Turkey's position is not brilliant, and it is forced to conclude such trade agreements. I want Turkey to become a strong state in the future and not to need such partners. I would like the Republic of Turkey to be closer to Western countries and those states that attach importance to the protection of human rights. And Russia can end this deal whenever it wants,” Dzhemilev said. Mustafa Dzhemilev also stressed that the annexation of Crimea had turned out to be a heavy burden for Russia, but the aggressor would never admit it. “Ukraine and Russia also had many agreements. But Russia violated them all and occupied Crimea. Turkey may face a similar betrayal. In my opinion, Turkey should be very attentive to Russia. Every day life in the Crimea is deteriorating. This is connected with the Russian economy as well. The occupation of the peninsula has become a heavy burden for the Russian Federation: It faced embargo and sanctions. Perhaps the Russian government regretted annexation, but it is lacking boldness to admit it. Russia has no courage," he concluded. Earlier QHA reported, that September 26, Prosecutor of the Autonomous Republic of Crimea Gunduz Mamedov, Prosecutor General of Ukraine Yuriy Lutsenko and Ukrainian Presidential Commissioner for Crimean Tatars Mustafa Dzhemilev will meet with representatives of the General Center of the Crimean Tatar Culture and Mutual Aid Society in Ankara. The Prosecutor General of Ukraine will discuss the occupation of Crimea with the Minister of Justice, the Minister of Internal Affairs and the Attorney General of Turkey.